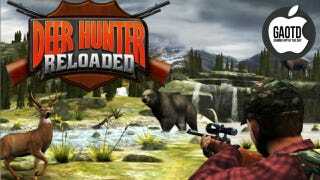 In This Deer Hunter Game, You Don't Play Russian Roulette. You Shoot Deer! I've never been deer hunting. The words alone don't even evoke images of wearing orange vests and shooting animals, but rather, images of Christopher Walkin playing Russian roulette. Oh yes, there is deer hunting in that movie, but I don't really remember it. Does anyone? So going into Deer Hunter Reloaded, I was subconsciously expecting Bob De Niro and extra bullets, but instead, I got "the most REALISTIC and AUTHENTIC hunting sim." Those aren't my words—they aren't my caps, either. That's according to the folks who made Deer Hunter Reloaded. I haven't played many hunting sims, so I'm not one to judge. But I was actually surprised at how nice this game looks. It even plays well with various modes; there's a stampede mode, a straight-up hunting mode with slow motion bullet effects, and there's even an x-ray mode that enables you "to target specific organs". If you are not one to shudder about going into the forest and shooting Bambi with x-ray vision, this is worth checking out. There's a free version, too.